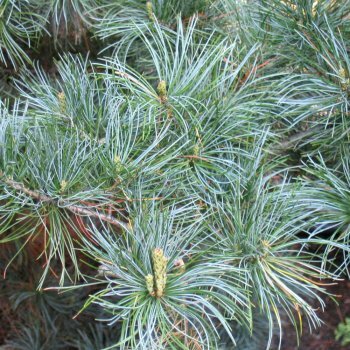 Pinus parviflora 'Tempelhof' is a small, architecturally attractive five needled pine tree with glaucous, steel blue foliage. It has a number of slender trunks that reach upwards and bear long lasting cones and display good blue colour all year round. Pinus parviflora are known as Japanese White Pine trees, as the needles can look whitish on some varieties. The height after 20 years is only 2-3 metres, so this small conifer is suitable for any sized garden and will look stunning in borders, as well as conifer gardens. Pinus 'Tempelhof' is salt tolerant and so suited to planting in coastal sites. It will grow best in well-drained soil, in a sunny position. When planting conifers, such as Pinus Parviflora Tempelhof, it is important to prepare the planting area well. Pot grown ornamental conifer trees can be planted at any time of the year. If your soil is poor, mix 50% of the original soil with 50% high quality compost, fill in the hole and firm around gently. Make sure not to bank the soil up around the collar of the tree as this can cause problems. We advise planting young trees with a stake and tie kit. To see how to use a tree stake and tie, watch our informational how to videos. Evergreen trees do not require a lot of pruning. Simply remove any dead, diseased or awkwardly placed branches from your Pinus Parviflora Tempelhof tree as and when you see them.